The Earth is bombarded by meteorites. The orbits of Jupiter and Saturn synchronize, causing Uranus and Neptune to change orbits. The inner Solar System is swarming with comets. Massive numbers of objects hit the Earth demolishing most of its surface. If life had allready started, it was now destroyed. The large craters on the Moon are formed. The heavy cratering on Moon and Mercury, and on the dating of the crystallization time of the lunar rocks, indicate that there has been a period of exceptionally strong influx of various impactors (asteroids, comets, meteorites) on the bodies in the inner solar system, and that this happened at about 500 million years after the aggregation of the inner planets. Most likely, this has been caused by a specific instability on the orbits of different bodies, and by the inward migration of the four giant outer planets. This caused a scattering of the asteroids and the Kuipert belt objects, directing them to new orbits both towards the inner solar system, and out of the solar system. 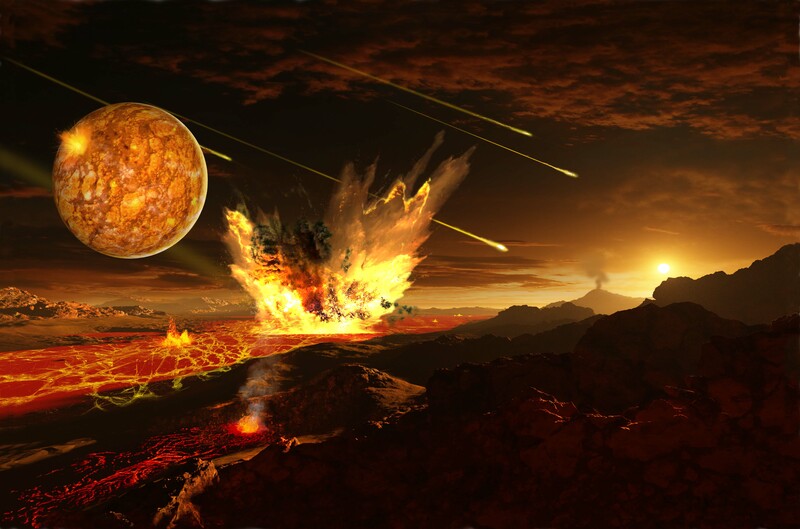 This episode caused cataclysmic disturbance in the conditions of the young planets, and would have had a sterilizing all life on Earth, if life had started there before this event. At the same time it also safeguarded the later developments, as it eliminated many of these objects from the vicinity of the inner solar system, where they would have posed a constant and continuous thread for later cataclysmic collisions.